The 2,3 has been replaced with a 2,5 from E30, and there's been fitted an adjustable Koni suspension, oil gages and sport seats. 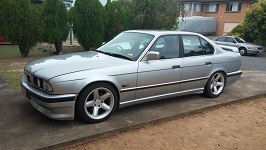 It has power steering, power brakes, electrick mirros, sport seats, adjustable Koni suspension, manual sun roof (bloody corrosion, GRR) and of corse the 171hp E30 engine. Great stuff. The front, rear and mirrors have been facelifted. Last edited by rasb1 on Sun May 22, 2011 11:15 am, edited 29 times in total. What are the dials on the centre there? My 81 323i doesn't have them, and I feel ripped off. My goodness that looks so damn good! SHINY! ALSO like niall said, the bbs wheels look absolutely stunning high polished! So clean and in immaculate condition! Fantastic colour, reminds me of my old e23 735i. BTW was the car parked at some car show or at the dealer or something? I see a cute Delphin E30 M-Tech1 there as well... except for the hubcaps! If I were You I would consider fitting E12 chrome door handles. It would make your car looks just perfect. The VDO dials in the centre are oil temperature and pressure. Originally there has been an analog clock, and that has been replaced by a digital in the main instruments. DAMN, IT LOOKS ABSOLUTELY STUNNING!!!!! I have to agree about those wheel Man they look nice, just as the rest of the e21 by the way. Really nice car, looks like new! Rasmus that is an awesome looking e21 you have, looks like had been rolled off the production line yesterday. Centre console looks good with the dials, factory looking even. I have a cut out from saturdays paper of an article on the new e90s, has the same line up of 3 series from e21s to e90. Mine are actually quite old... they're from ´85 i think... but still going strong. They're starting to flake a bit, so are going to get them restored at some point, but i'm a student so the $$ are very limited, hehe.